We left Napier on Tuesday morning ready to tackle the hills to make our destination for the next few days, Mahia Peninsular. We headed off following Brian & Marj at a respectable distance to let traffic past, up and over the hills, some of them long slow climbs, which is no problem for our grunty engine. Brian found a good pull over for both of our rigs in time for morning tea, a good time to stretch the legs and check out the wild chickens that seem to frequent a number rest areas in New Zealand! Then it was time to continue on our way, and it wasn’t too long before we arrived in Wairoa in time for a lunch break alongside the river. 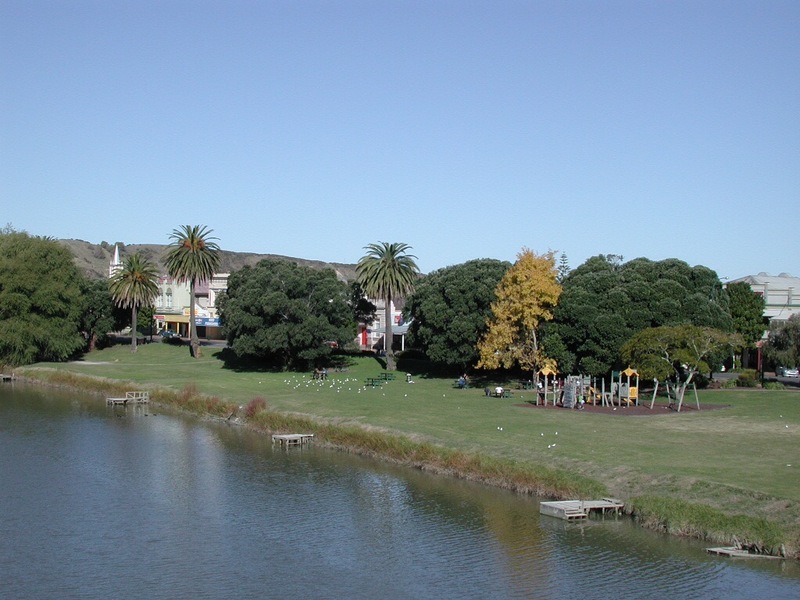 Wairoa has had a bit of a checkered history, but these days it is looking prosperous and a tidy wee town. Wairoa from the bridge looking back onto the town. Next stop was at Mahia Peninsular, we were to park at a reserve on the northern side of the Peninsular. We arrived mid afternoon and quickly set ourselves up in the reserve next to the bollarded area set aside for tenters……or so we thought! More on that shortly. Roy and I headed out for a drive around the coast as far as we could go before the roads ran out, to check out the landscape. 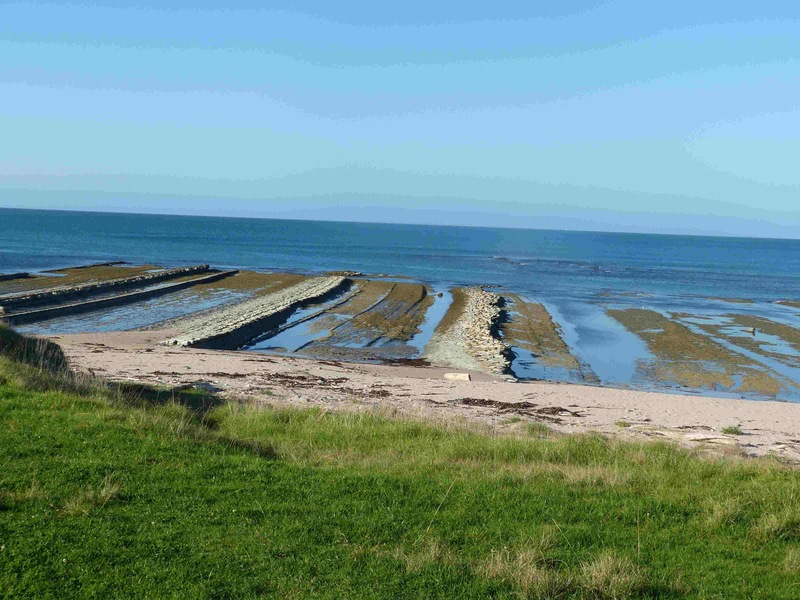 There are large rock shelves all around the coastline on the northern side of the peninsular, they are quite spectacular at low tide, showing off their formation for all to see. No,these are not man made formations, all are done by Mother Nature. Back to the van, time for dinner and then settle down for the evening. I should add here that there were four other vans parked up plus one small tourist vehicle. However, our peace was to be interrupted by a French tourist knocking on our door. She had just been approached by a Council employee stating that we should ALL be parked in the small area behind the bollards, and if we did not move then we would be up for a $200 fine! Hmmm, we asked ourselves why did the council employee approach the only vehicle that was obviously a rental and ask them to relay the news? And where were the signs indicating that we could only park in the small bollarded area? Harumph, mutter, mumble…….so in the dark, we all packed up and crammed into the “designated” parking are, an exercise in juggling vehicles around tents and cars, squeeze in we did. Well, bother that, tomorrow we will all leave. And leave we all did, up over more long windy uphill roads to Gisborne. Our intention was to travel up around East Cape, however, these plans were also about to change as the Gisborne Camping Pass and parking sites are only available over the summer months, and with very little choice in other parking options we again decided to change our plans by staying in Gisborne for a couple of night and instead then head through the Waioeka Gorge to Opotiki. However, these plans were also to change slightly as Marj was not well and needed to visit the hospital a couple of times. She is much improved now and we intend to continue on our journey tomorrow. The bonus extra days here in Gisborne meant we could check out the Gisborne Market on Saturday morning, which we did, again filling the fridge and pantry with some goodies! The weather has been lovely with clear blue skies most days, and warm temperatures as well.